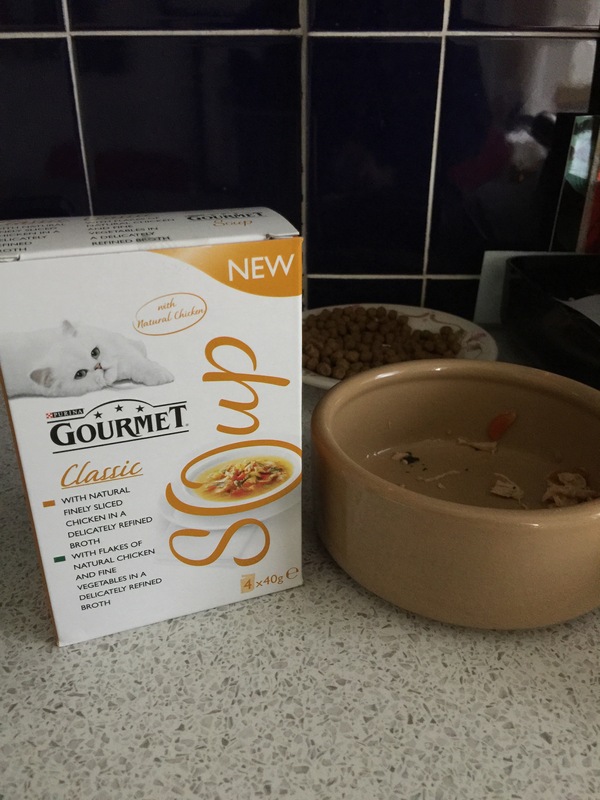 On the surface of it this soup for cats idea seems ridiculous. But consider for a moment what your cat does when you feed him/her. If they are anything like ours their first action is to lick all the gravy or jelly off the bits and then depending on their habit eat or not eat what is left. Ola then often leaves most of the remains to Bertie who will eat pretty much anything. He is a very well rounded individual whereas Ola is a more highly strung creature who doesn’t really like meat, odd in a cat but she loves her biscuits. She also loves this soup, at least for now and I have to say it smells delicious. It should at the price so it will be a treat for Ola when it is on offer. While I was taking Worth’s mother home after Christmas, the District Nurses got a bit carried away ordering things to help him. “You need a hospital bed” they said, “erected in the living room with an inflatable mattress”. I do understand they were thinking of his comfort in bed but that whole idea would be a nightmare as anyone who knows my house would know, not helped in the least by not having a downstairs toilet, so also coming was a commode and a cushion. Worth did not wish to move downstairs so when this stuff arrived I declined the bed, which as it turned out he couldn’t deliver anyway. “Never told me about those steps love, can’t do it on my own”. So the commode was taken upstairs where it still is, as was the cushion. I was curious to read the instruction manual for the cushion; I have never considered a cushion needing an instruction book. Clearly I have been wrong. It has a very high opinion of itself. The Elf read it before she saw the cushion and her expectations were sadly shattered when she saw the actual thing. The next day a mattress arrived for us to put on our own bed upstairs which was a more practical solution to Worth’s comfort but in the event none of it was used, and it all remains in the back room. They are supposed to be fetching it next week. My little Parker and your Bertie eating together would be a riot! I have to feed Teemu separately from Parker. He eats so slow and she inhales her food. Cats are funny little creatures, but I do love them so! I cannot tell you how pleased I am that you have decided to continue your blog as it was something of a daily ritual for me over the years. I will not comment much but will take great pleasure in following your Year. I wish you and your Family, including Adrian’s mother, Health and Happiness throughout 2017. It fell apart a bit last month as things at home got tricky. It upset us both but we ran out of inspiring and amusing things to witter on about. It might not be daily but it will be as often as my new life allows.